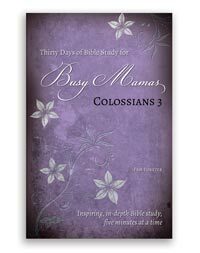 You might remember that I was working through a study of Colossians 3 called Thirty Days of Bible Study for Busy Mamas. Now it's time for me to share some thoughts with you! I thank Doorposts for sending this Bible study to me for review purposes. I wanted to complete the study because I wanted some tips and tools on an in depth study. I also wanted to really focus on one book/chapter of the Bible for a month. Busy Mamas met those needs! A short, daily commitment. Each day we spent just a few minutes in the Bible, typically 5-10. It is truly a blessing to complete an in-depth study in just a few minutes a day. Easy to do. Pam shared why we did each task and made it easy to complete. Read. Each task helped us to read and reread the chapter. Marking to remember. Pam suggested that we print a copy of the chapter if we don't like to write in our own Bible. I did this because I was not sure I would want all the marks in my own Bible that she would suggest. Though I only like to write in my Bible occasionally, I really liked marking up my copy of the chapter! Bigger perspective. Though the focus was on Colossians chapter 3, she did encourage us to read all of Colossians once or twice. Catch up days. She provided built in catch up days that could also be used to complete extra, challenging Bible study. Internalizing. By reading the same chapter for so long, it became very familiar! Note taking. After marking in the Bible, we answered questions, created lists, and such. This helped me to understand my markings even better. I think a lot of non-mamas are busy, too, and more might be inclined to the study with a different title since it is not about parenting. Sometimes it was hard to remember why I marked (since I didn't color code which was suggested). By looking at my notes, I could usually determine my reasoning though. I almost felt that I marked it so much that some really important things wouldn't stand out. By the final days of the study, I became half-hearted. I think this is a reflection upon me and not the study, and certainly not the Bible. Though highly beneficial, sometimes I tired of searching for certain words. Just being honest. I think I'm lazy and like to be told what it means instead of trying to determine for myself. I would like to pass along my gently used copy of the Busy Mama's Bible Study for one reader. To earn a chance at winning, please follow This Simple Home using RSS feed or by email. Then leave a comment telling me how you follow with your email address in the comment. ~ Share about this giveaway and leave a link in a comment. Please tag me with This Simple Home on FB and @thissimplehome on twitter...of course you could blog about it, too. (If you tag me, don't feel the need to leave a link, just the comment.) Thanks for spreading the word! ~ Pin a different post from this site you like to your Pinterest board or share a post/the blog on Facebook! Leave a comment telling me which me what you did! Giveaway will run through Wednesday, November 6th. The winners will be contacted by email and have 48 hours to respond. Random.org will help to choose the winner. Winner will be announced on Facebook and on this post. This giveaway is limited to the US for the paperback. Thanks for entering! Disclosure: This post contains affiliate links to Amazon. Doorposts provided this book for review purposes but all opinions are my own. I'm always looking for a new Bible study that can be completed in a few minutes a day! Sometimes that's all I have. :) I usually end up spending an hour or two on the weekend in one big chunk to catch up but I'm hoping to eventually change that as my kids get older.